Does your toddler or baby need help sleeping through the night? How can I get my baby back to sleep when he wakes up in the middle of the night? How can I get my toddler to stay asleep? Some of these exhausted mothers had babies who were four months old and some had kids who were four years old! Their babies, toddlers and preschoolers were waking anywhere from one to three times per night — every night. I feel for these moms because a good night’s rest is so important for a busy mom — without it moms can get downright cranky. Babies, toddlers and preschoolers need well-rested nights too. These techniques work for babies, toddlers and even preschoolers that are struggling with staying asleep at night. But before we dig in, I have some REALLY exciting news to share with you! If mom and baby are rested — everyone is a winner! If you’re struggling with your toddler sleeping at night, you also may be struggling with your toddler taking naps too — right? Here’s some happy news: there’s a course for that! An awesome, super-fun and simple course that helps toddlers and preschoolers begin routinely and successfully napping in only six days! 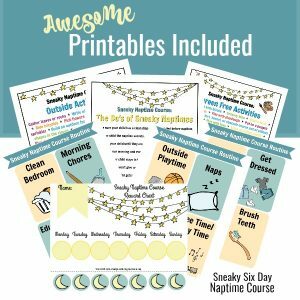 And it comes with a large group of printables to help kids and parents stay nap time focused. Just LOOK at all those printables! Kids who nap better during the day often sleep better at night. Day and night sleep patterns are definitely connected! Check out the Sneaky Six Day Naptime Course for Toddlers and Preschoolers today! Simple changes to your routine can have your little one snoozing regularly in as little as one week — of course there are always exceptions, most of which are due to health issues. But the typical, healthy baby or toddler will benefit greatly from these changes. Note: These ideas are not for newborns or babies under four months of age. These only work for babies ages four months up until preschool age. Also, if your baby, toddler, or preschooler awakes with a sharp, wincing scream ignore all the below and check for long hairs tied around fingers or toes, nightmares, soiled diapers, etc. Never ignore a painful cry! But these tips are NOT for the faint at heart. 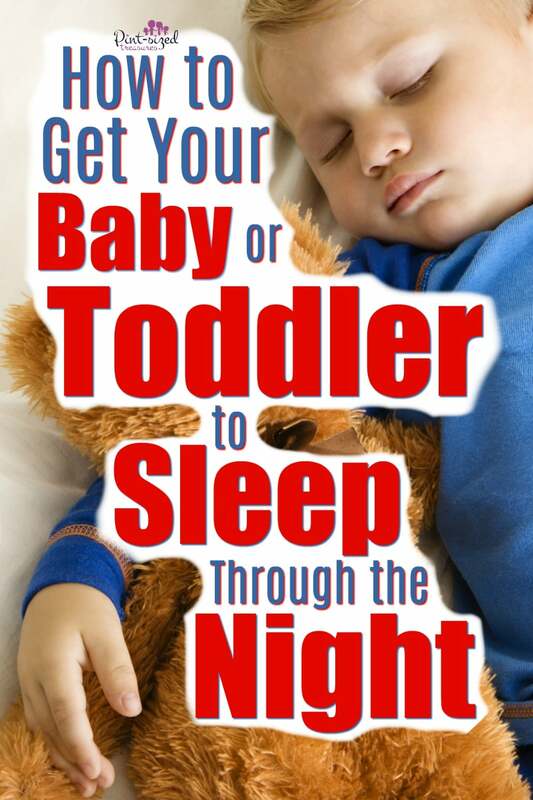 Toddlers and Preschoolers Need Their Sleep! Guiding your child into a healthy sleeping pattern is one of those things in which you have to decide that adequate rest is absolutely necessary for your child’s mental, emotional and physical health. It’s the same reasoning behind making your kids eat healthy food instead of donuts and marshmallows at every meal. Sure, your little munchkin may not like these ideas initially, but eventually your child will enjoy benefits of a lifestyle that’s full of healthy sleep! In fact, your entire family will reap health benefits from a young child who routinely sleeps through the night! And healthy sleep transforms fussy, unpredictable children into well-rounded kiddos! Gradually remove unhealthy sleeping props. A blankie or a stuffed teddy is perfectly normal, but a nightly rocking routine or cuddling until your child is fast asleep will only make the sleep process more difficult for both of you. I love, love, love to rock my babies and toddlers, so I do it during the day. We get lots of cuddle time in throughout the day, but all of my kids are able to fall sleep on their own and stay asleep. There are times when I break the rules and rock them all the way to sleep, but those are exceptional times and don’t seem to change things up too much. Bottles or breastfeeding is also a prop you want to avoid. Make sure your baby or toddler is full, but wide awake when you lay him down at night. If your child depends on drink, food or nursing to go to sleep, he will then depend on it in the middle of the night if he stirs or changes position. A healthy routine is one where your child gets plenty of love and nourishment throughout the day so that when rest time comes, he does not depend on those things to fall asleep. Many times babies and toddlers develop sleeping problems from lack of a schedule or routine. Develop a routine that works for your family and stick to it. Here’s a great resource for creating the perfect routine for toddlers and babies! Don’t let the clock be your master, but let it be your guide. Follow a daily pattern to give your child security that will follow him from morning all the way through to dream land to ensure a good night’s rest. 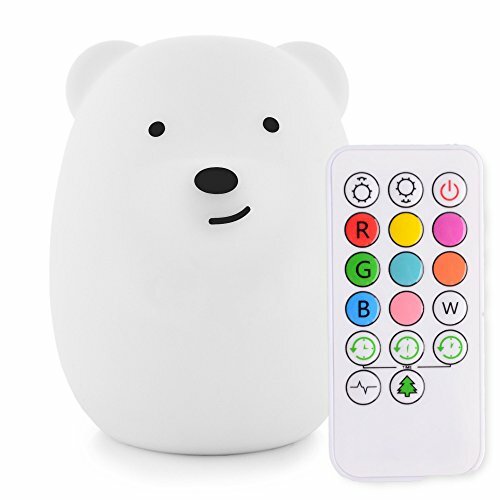 Keep things dark and quiet at night. If your baby or toddler awakens during the night, don’t jump out of bed and turn the lights on. Talk calmly and keep the lights low. Invest in a simple night light so the lighting doesn’t change. Here are a few of my favorites below! Speak in low tones and don’t make the middle of the night seem exciting or fun. 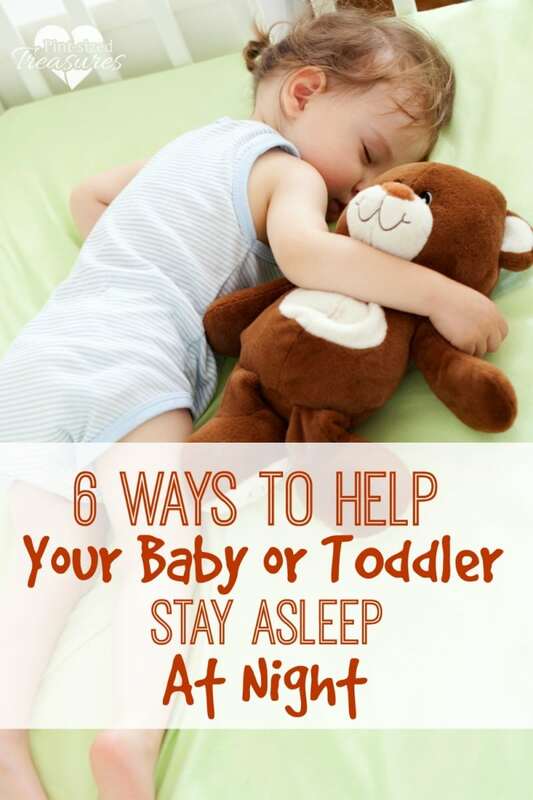 Sometimes just this one simple step helps little ones get back to sleep since it’s super boring in the middle of the night! Don’t reward your baby or toddler for waking up. Give your toddler a hug, a reassuring pat and let that be the end of it. Don’t let your munchkin crawl in your bed and fall asleep night after night. It will become a habit and everyone’s sleep will be interrupted — your child’s, yours and your husband’s. If your toddler has had something to drink before bed time, surely he can wait until 6 or 7 am for a glass of milk. If you are struggling with a baby, it depends on your baby’s growth needs. If your baby is falling asleep after two or five minutes of breastfeeding, you know you are a pacifier or sleeping prop. Instead of feeding your baby right away, try calming him down and putting him back to sleep. He may fuss at first, but eventually will learn that mommy is not a nighttime pacifier and he will be able to soothe himself. He’ll thank you later for helping him to learn to sleep on his own! This goes for toddlers or preschoolers that may be watching too much Elmo or Little Einsteins at night. It’s fun to cuddle up with your toddler in the evening to watch their favorite cartoon or movie, but if you view it too close to bed time, it may be difficult for your child to fall asleep and stay asleep. Try to get your movie cuddle time during the day or late afternoon. 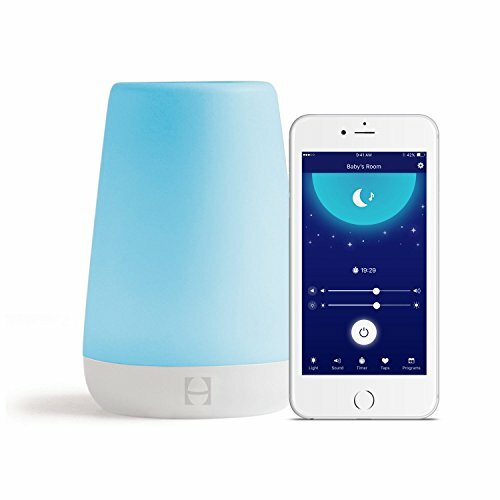 Create a calming bedtime routine. As it gets closer to bedtime, really wind things down. Give your baby or toddler a nice warm bath, read a story and end with some warm milk or a bottle. Gently rock your child or sing lullabies, but keep everything slow and calm so they are winding down instead of up! Remember, it’s fine to rock your baby — in fact, I recommend that close, cuddle time — just don’t rock him all the way to sleep! What have you found that helps your baby or toddler get back to sleep in the middle of the night? There’s exciting news for parents, grandparents and teachers of toddlers and preschoolers! 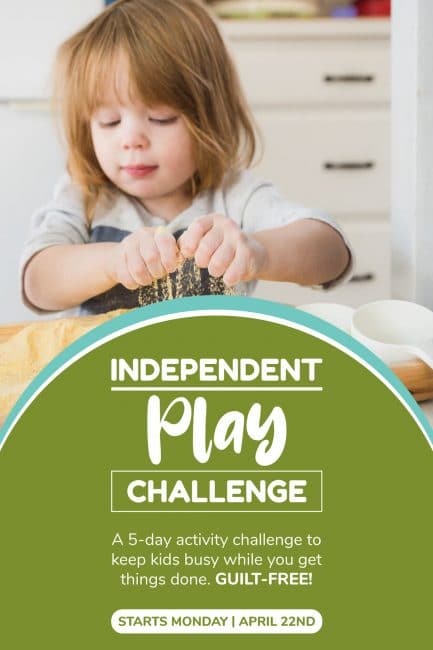 These activities are shown LIVE so your toddler can follow long live if you’d like! 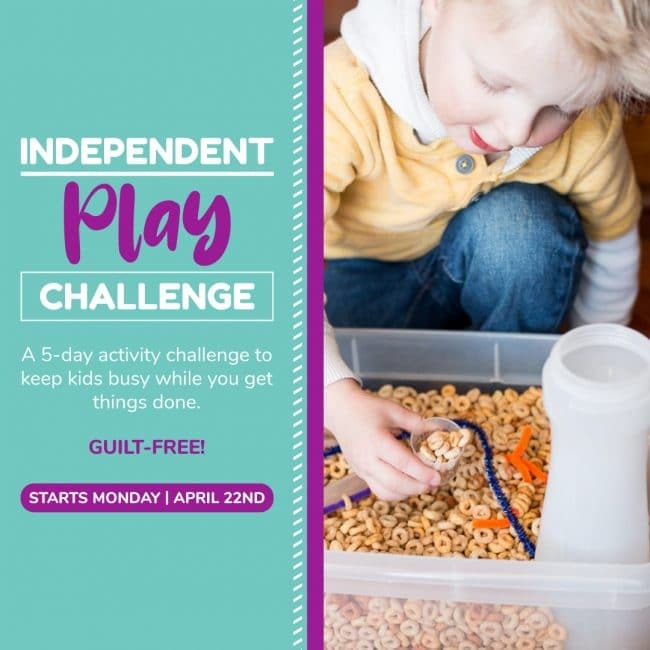 Plus there’s a group on Facebook with other moms and little ones who are joining the challenge!